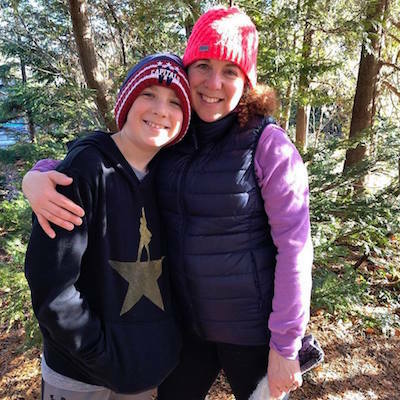 Waldorf education promotes outdoor play throughout the day for all ages for very important reasons – and why this is one of the most attractive things about sending my son to a Waldorf school. No matter the season, I love to hike outdoors with my children. It can be a gray day with heaps of snow or a lazy, hazy afternoon. Sometimes rain sprinkles down and other times, bright sun illuminates our way. From their earliest days, I’ve taken my children outdoors, and that doesn’t change as they grow older. The inner playfulness of even my oldest teenagers comes out when we immerse in nature. Tall trees become forts, everyone loves to skip stones and dip their fingers into cool streams, and we open ourselves to the possibilities of the infinite when faced with an endless sky and a colorful horizon. This picture was taken January 5, 2019, along the path at Cranbrook House and Gardens with my son, Shaya Schreiber, DWS 7th grader. One of the things I love about Waldorf, and a key reason that I switched my youngest son here in third grade, is that outdoor play is an integral part of the Waldorf approach to education. Schools like ours send students outside in every season because our teachers and staff understand the importance of immersing in the natural world in all weather. Connection with nature is soothing for the soul, invigorating for the mind, and health-promoting. In Finland, the top educational system in the world, school children have 15 minutes of recess for every 45 minutes of learning throughout the day. Research shows that recess helps children synthesize classroom lessons. At DWS, outdoor time takes many shapes and forms. Before school, children play in the brightening dawn before settling into the classroom for main lesson. Mid-morning, children greet the day with a recess, followed by one at midday and one in the afternoon. Extended care takes place outdoors whenever possible. When I taught the creative writing club last fall, I took our creative writers outside for a vigorous game of Ga-Ga Ball to get the creative juices flowing. This winter, writing club will include hikes in the neighborhood and on Belle Isle because when we are one with nature, we have far more profound things to say. When I taught the creative writing club last fall, we found Detroit Waldorf’s Bug Hotel hiking outside the school. In Waldorf education, gardening and environmental studies are critical for many grades, taking children all over campus for immersive learning. Mr. Honey leads children outdoors for physical education most of the year. Knowledge needs time to seep in – and that happens best when there is a break from straight-on learning. You know what I mean. Even for working adults, a walk in the fresh air and bright light helps reset any stress we might be feeling at our desks. Waldorf philosophy is based on the idea of capturing what is natural for children, who experience the world through their senses. Learning takes place on the playground as deeply as with structured learning. But I’d argue that it’s natural for all of us, no matter the age, to connect with the world, and get to know ourselves better, when we spend regular time in nature. "Our play-based early childhood curriculum is grounded in the idea that children have an immense need for movement which naturally integrates and enhances what they are learning,” she adds. A lack of enough play time, not to mention distance from fresh air and winter sunshine, leads to a lack of ability to self-soothe, to think outside the box and to develop a strong sense of imagination. Research from the University of Missouri-Kansas City shows that outdoor play promotes brain development while improving fine and gross motor skills, dexterity and balance, through exploration, risk-taking and fun activities on the playground. Ever feel cooped up inside? During a Michigan winter, the air can feel stuffy, as it recirculates from the furnace throughout room vents. Lack of fresh air can lead to illness. Going outside helps diversify the elements we are exposed to in winter, and the deep breaths of cold crisp air can refresh children, and give them breaks from exposure to germs. The more time we spend outdoors, the stronger our immune system becomes. Dressed properly, children who play outside in winter often develop stronger autoimmune systems and resistance to allergies, experts say. Some research suggests that physical outdoor activity boosts the immune system for a full 24 hours! Imagine the impact if your child is playing outside several times every school day. And, what better place to spark the imagination than the great outdoors? DWS children love to build snow forts, dig in the dirt, stare at cloud formations and watch birds wing across the sky. Even building a snowman is a pathway to problem-solving, creativity and teamwork. This winter, as DWS children come home eager to share stories of their outdoor adventures, consider bundling up and joining them outside for a walk in the woods or a weekend outdoor adventure. It’s not only good for children to step outside in colder months – it’s warming for all of us, in so many magical ways. Lynne Golodner is the Huntington Woods-based mom of DWS 7th-grader Shaya Schreiber (as well as three older children). Lynne also manages marketing and communications for Detroit Waldorf School.